David Hockney, OM, CH, RA is an English painter, draughtsman, printmaker, stage designer and photographer. An important contributor to the pop art movement of the 1960s, he is considered one of the most influential British artists of the 20th century. The print is based on a line drawing studies of artists. David Hockney distinct attire and bleached blonde hair marked him out in Bradford in the 1950s. 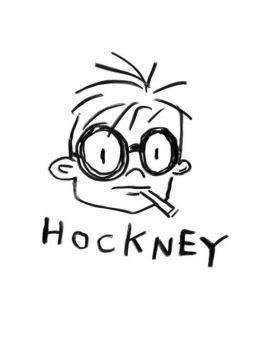 The line captures the youthful distinguished Hockney puffing on a cigarette. Brighter eyed and inquisitive.